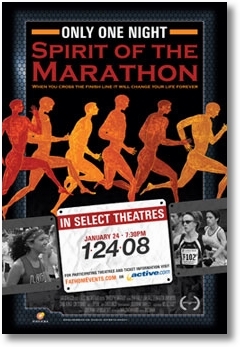 It has been more than a year now since I first saw the trailer for the movie, Spirit Of the Marathon. I knew then I wanted to see the film. It made it debut, the weekend of the this year’s Chicago Marathon. Due to travel and other logistics, I was not able to work the screening into my schedule. Now, it will be released as a one night only special engagement, January 24, 2008. The film tells the story of six runners as they prepare to the the 2005 Chicago Marathon. Since this was my first Marathon, maybe I’m one of the extras…You never know. For a list of theaters or to purchase tickets, go to FathomEvents.com. This entry was posted on Sunday, December 23rd, 2007 at 11:05 am	and is filed under General. You can follow any responses to this entry through the RSS 2.0 feed. You can leave a response, or trackback from your own site. Have you bought tix? We bought tickets for the hollywood 27 premiere and Jeff bought some, too. How about a triple date??? Thanks!! I appreciate the index…and it is playing even in our small city!! Will be good to see if my son, soon to be home from Iraq, will want to go with me!! I just got an email the other day from the store I run for – they thought it would be a good team building event! I need to check and see as I might be out of town, but will have to let you know if I do go! Oh – and MERRY CHRISTMAS or whichever holidy applies!! Wishing you lots of PRs in 2008!! Very very cool! This is the first I’ve heard about the movie. I’d love to see it!